The USAID-funded project to enable Cambodian society to identify priority issues in Cambodia and supported tech companies with tools to address such problems is now five years old, and as DI turns their focus towards nurturing Khmer individuals and organisations to employ the use of technologies to create a greater impact, we sat down with Kate Heuisler, DI Cambodia Chief of Party, and Vibol Theng, Deputy Chief Party, to hear about the successes and learning over the past five years, and what the future holds. Kate Heuisler (KH): Project DI was built around a user-centered approach in 2014, and worked with civil society partners to identify priority issues in Cambodia, and see how tech companies and tools could help work with them to address those problems. Originally, the project was three years long – focused on events to help connect the tech and civil society sectors, trained Cambodians in utilising new technologies, provided seed grants to test tech-enabled projects and a co-working space that encourage collaboration and problem-solving of social issues. In 2015, DI funded more grants so that civil society organisations and tech service providers could design and test new technologies in their work. The funded projects ranged from digital monitoring and evaluation tools, to websites to promote the organizations, a crowdfunding platform to help online fundraiser for social projects, to an interactive voice response system to help educate new moms in baby care techniques. In 2016, the co-working community grew rapidly across Phnom Penh and we decided to close the DI co-working space. Instead, we focused on direct training and coaching in Khmer for individuals and organizations that wanted to use technologies in their work to reach more people and create a greater impact. The DI model was built to be flexible and adaptive to the ever-changing landscape of Cambodia. Without this mandate to adapt, we wouldn’t have been as successful, or as relevant. In 2017, we won an award from the USAID Learning Lab for using these adaptive management practices to get results. What were some successes in the past 5 years? KH: 1) Successful Training Sessions – 90% of our trainees were ‘highly satisfied’ to ‘extremely satisfied’ with our training courses, and 89% of the video trainees reported that they made additional videos after the training course. This was important for us as we wanted to go beyond the certificate courses and make sure people learned practical skills they could apply immediately to get results. 2) Technovation Cambodia – The global tech entrepreneurship training programs for girls ages 10-18, has exceeded all our expectations in Cambodia. To frame the challenge, as of 2016, only about 7 to 8% of university-level computer science majors here were women. Technovation began with one team from Cambodia in 2014, and has expanded to 44 teams from Cambodia across three provinces this year. More than 500 girls have learned essential hard tech and soft skills that both employers and the country need to help solve the problems of tomorrow. We need more Cambodian role models in tech, and more girls trained in these skills so there is a balanced workforce ready to serve employers’ needs. 3) BarCamp – BarCamp, the largest and most established tech and startup-focused community event in Cambodia, also expanded its reach under the DI program. DI funded the design and implementation of 11 BarCamp events over two years, helping them expand to reach more than 6,000 new people, especially in rural areas. Today, BarCamp continues to thrive because of the commitment of the organizers, their understanding of changing tech needs and trends, and buy-in from the private sector to support the programs. Vibol Theng (VT): 4) World Education’s literacy assessment tool started as a small-scale pilot for grade 1 students and teachers, and has now served more than 12,000 students across the country, and helped more than 600 teachers save time so they can spend more time helping kids learn. During follow-up with teachers, 100% of those surveyed said that using the TEST App to administer the interval assessment saved time, while 77% said helped them identify student results immediately so they could provide extra help for struggling students. KH: There are many other projects that I expect to have big impacts in the future, but my favorite big wins are our human resource ‘results’: our staff, grantees, Technovation participants, and training clients. What surprised you the most in your past 5 years at DI? KH: How low-cost real innovation can be if you include the right people, and create an enabling environment. Creativity is hard to teach and can flourish when you let people experiment. VT: What surprised me was how fast the tech community grew in such a short period of time. In 2014, many people had no idea what human-centered design was, but now many NGOs are bringing design firms in on their projects because they see how important it is to focus on users if you want to have impact. KT: The focus for the next year is to address two gaps we have identified in the sector. 1) Women are hugely underrepresented in both tech and formal business, including the start-up sector. We want to work to understand and address some of the key constraints to more girls and women having access to opportunities to be innovators. 2) Young people need more mechanisms and ways to learn how to innovatively use the innovation processes. Many startups stay stuck at the idea stage and can’t transform into investable and scalable businesses. We want to design programs with partners to help give young people more opportunities to learn new skills and grow their businesses. 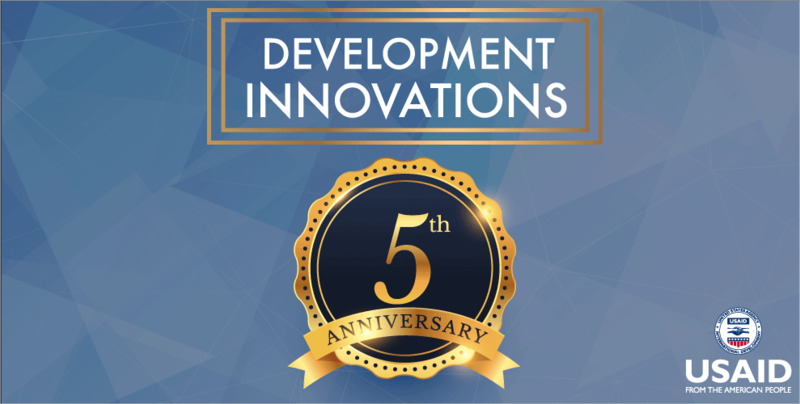 3) With the successes from the first five years and DI’s overall mission, we hope for scalable social innovations that addresses critical development needs. DI hopes to fund the expansion of startups and serve more Cambodians to solve their problems. How has Cambodia (and the tech sector) changed/developed during DI’s lifespan? KH: The use of Facebook has exploded from 1.42 million Cambodians in 2014 to 6.8 million in 2018. There has also been an increase in the trust around online payments, which opens up lots of opportunities for both NGOs and businesses. Digital payments can save time and money and digital monitoring tools can automate certain systems, helping organisations use data for decision-making, and improve reporting time. How does the tech sector look today, and what are your predictions for DI in 5 years time? KH: The tech sector is growing rapidly, and getting a lot of support from people like the U.S. Ambassador, the Royal Government of Cambodia, development projects, our partners at Smart Axiata and Ezecom, investors, and from regional hackathons and accelerators. However, two challenges I see are that many people still believe tech is the solution to all problems (it isn’t always, especially without good, people-focused design! ), and that there is a perception that running startups lead to big, quick financial wins, yet some startups, especially those working to address social issues, are struggling to validate their business models, break-even; many more struggle with financing, and figuring out the best options for growing their businesses. I would like to see more mentors from the business world partner with emerging entrepreneurs, give them real feedback on their models, and help the start-ups benefit from their real-world experience and existing networks as they grow. In five years, I believe many of the girls we helped train in the Technovation program will be designing new technology solutions to solve problems we haven’t even identified yet. The whole country will be more connected and networked, and more citizens will have digital literacy skills. It is essential that no group, especially women, gets left behind in this growth, and that everyone has the opportunity to learn and use these skills as Cambodia continues to go digital. What are some future plans for DI services when funding from USAID eventually ceases? KH: Specifically, Cooperation Committee for Cambodia will run the Khmer-language practical video production course for NGOs, and Impact Hub to run numerous programmes that will support social entrepreneurs. DI looks to partnering with SHE Investments where they will grow their tailored accelerator and incubator service for female entrepreneurs. After the closure of DI services, all of DI’s materials will be Creative Commons resources and users can download an online toolkit to curate the training course information, curriculums, handbooks, and other tech resources we have created during the project’s lifetime. We hope organisations and individuals will continue to download them, adapt and use these resources in their future works. In 2018, services for innovators and entrepreneurs will expand exponentially in Phnom Penh. There are more than 15 different co-working spaces, design studios, and business incubators of all types across Phnom Penh, and more and more creative projects to support young innovators are starting up each day. DI will be releasing a research study on the tech and innovation landscape in June this year, which will provide details about the current services, and growth of the sector over the past five years. DI services will be extended for one more year and will likely close in 2019. With the recent partnership with Impact Hub Phnom Penh and Cooperation Committee for Cambodia, many of the project’s services offered over the past 5 years have been taken over, and will continue to live on to serve the community of innovators and social entrepreneurs in Cambodia.